I've been wondering, lately, how it is that we each manage to get through the day, cooking for ourselves and often our partners and children. How do we manage? How do we plan (or not), and what do we eat? Maybe it's a strange series of questions to ask, but I find that most of us are so involved (rightly so) in our own routines and habits, we rarely discuss what occurs in each other's kitchens. And I'm not talking about a pre-scheduled dinner party, either. So that's what I want to talk about today. As for my own routine, I meal plan most weeks, a habit I took to years ago, right around the time when I started working full-time. It just makes life easier knowing I've already thought ahead and designated a meal for dinner. It keeps me calm. It gives me something to look forward to. Sometimes meals are switched around, of course, or an impromptu dinner out ensues, but generally you can find me at home Monday through Friday standing at the stove soon after getting home from work. The weekends are a bit more leisurely. While I do tend to plan those as well (except for days I just want to roam the market and see what happens, which happens a lot this time of year), I like leaving room for a dessert I've bookmarked or something more involved that I don't have time for mid-week. (homemade croissants, anyone?) Also, there is almost always some version of pancake or waffle at the breakfast table. It's borderline obsessive. Recently, I made stew. I don't typically associate June with stew, but it turned out to be the perfect accompaniment to an unusual bout of gloomy Los Angeles weather. It rained, actually. Really rained. Our state is always in desperate need of water, we just don't tend to receive much of it during the spring. So here I am in the middle of the year, making stew. And harissa, I should note. Have I told you about Amy Chaplin's new cookbook yet? It just won a James Beard award (!! ), and has reignited my interest in grain soaking. I dare you to close her book without feeling inspired. Somehow, Amy makes the basic act of soaking rice and quinoa a meditative moment, and you can't help but feel enormously healthy and on top of things when you remember to pull out your bowl and pour water over the lentils before you go to sleep at night. There's something deeply poetic about the whole thing, especially when you consider rhythms of poetry. We find similar rhythms in our kitchens, too. We move from the sink to the refrigerator seamlessly, opening the door like a line break, taking out the pitcher of water. Next line. And so on. I've been making my way through this cookbook slowly. First I read it cover to cover and kept track of the recipes I wanted to cook (along with their page numbers) on post-it notes. The inside front cover is now a pale shade of yellow, almost like homemade mayonnaise when you make it with yolks. Lately I've started prepping a few things on Sunday to help make cooking faster during the week. Amy's harissa is the perfect example of make-ahead condiments, destined for a robust quinoa salad. Quinoa salads have had their run, haven't they? First, no one really knew what quinoa was. Then no one knew how to cook it properly. There have been debates about how to make it fluffy, and whether or not our healthy grain habit it making matters worse for the people of Peru. There were lots of bland recipes, too, but quinoa doesn't have to be bland. This is one of those wow! yum! pow! salads that hits you over the head thanks to a few spices like cayenne and coriander. It's probably the simplest homemade harissa you can make, but it makes an entrance. Roast some summer vegetables, saute rainbow chard in garlic oil, and toss it all together with a sprinkle of cheese. I can't say enough good things. And as for your own kitchen routines, I'd love to hear about them. They're deeply personal yet wildly relatable, aren't they? Warm a small skillet over medium heat and add the whole spices. Toast seeds, stirring occasionally, until fragrant (about two minutes). Transfer to an electric spice or coffee grinder and grind until fine; pour into a bowl. Add the paprika, cayenne, garlic, salt, oil, and lemon juice. Stir until smooth. Store in a sealed glass container for up to two months in the refrigerator. I didn't follow her quinoa salad recipe very closely since I had a variety of other ingredients on hand. But the general method goes something like this. I roasted zucchini and cherry tomatoes, and while those were in the oven, sautéed half a bunch of rainbow chard with plenty of garlic. (Amy's recipe also calls for red peppers, which would be fantastic.) Then I dumped in the fresh herbs (parsley and basil), crumbled in feta, and spooned harissa over everything. One hundred miles might seem like a long drive for a picnic. You are not wrong to think so, but our destination was a place of respite, something we desperately needed. Normally I would have planned an elaborate lunch, cooking pasta salad and assembling sandwich ingredients, trying new recipes, buying cheeses, generally overdoing things. But lately I've been learning the important lesson of letting go, conserving my energy, and not doing everything myself. It's hard to do, but freeing. I bought most of our provisions earlier in the week from Good Eggs, and had them delivered on Friday. Local goat cheese, salami, beet chips, and seed clusters for snacking made for the best picnic fare I could have hoped for. Early Saturday morning we tucked Emma (the dog) into her travel bed in the backseat and stopped by a favorite bakery for ham and Gruyere sandwiches and two macaroons to finish our meal. An hour and a half later, we were eating brunch at Jeannine's in Montecito. It's a long way to go for a picnic, yes, but we ventured out to find Nigel Slater's "good stuff." In this case, we knew where it was located already, we just needed to drive there. Our "good stuff" is the shaded patio of Rusack Vineyards, overlooking a mountain lined with grapevines, a glass of Rose in one hand and a bite of cheese in the other. And a warm breeze. I've been making my way through The Kitchen Diaries, a volume I've been longing to read, and the way it's written in monthly chapters makes it easy to revisit throughout the year and read month by month to glean inspiration. For picnic inspiration, I turned to the month of August. Yes, I'm a bit far ahead, but the weather we've been having has made it feel like summer, so I've been craving lighter fare. For meals outside, a zucchini, basil, and goat cheese salad is perfect. Dressed with oil and lemon juice, you can barely call it a recipe. It's more like a suggestion for having the most splendid afternoon. This is what I would have made had I been able to fuss with it, but as I mentioned, I let others do the work for me this time and was grateful for the rest. Back at home, though, cooking is in full force. Heat a grill pan over medium heat. Brush each zucchini strip with oil and place on the grill pan. Cook for three to five minutes per side, until golden grill marks form. Arrange on a platter, then whisk a tablespoon each of oil and lemon and drizzle it over the zucchini. Scatter the basil and goat cheese over the top before serving. After eating at The French Laundry last year, friends asked if the experience had ruined dining out for good. How could I ever step foot in another restaurant without suffering severe disappointment? This is a legitimate question, one I asked myself long before walking through the blue doors, but my response has been a confident No, it did not ruin anything. Quite the opposite, in fact. I've never compared The French Laundry to any other restaurant. In my mind, it was a unique experience meant to be savored and remembered fondly in a category all its own. What I did compare the experience to was everything I had already learned about Thomas Keller. For Chef Keller, urgency is what motivates his team of chef's. From the second they arrive in his kitchen, chef's are working against the clock, pushing their boundaries of creativity, and seeking to create a restaurant experience that is utterly memorable. It's not perfection itself, but the pursuit of it, that drives him. I was reminded of this lesson during a recent pizza and wine night when we decided to watch Ratatouille. Because, of course, nothing goes better with a good meal than a film about good meals. Before turning off the television, we watched one of the bonus documentaries featuring a discussion with Thomas Keller, who developed the staring recipe, and Brad Bird, the film's director. Chefs and directors are not very different. For Brad Bird, every day was an opportunity to make the film better. Even small changes that seemed unnecessary, like lightening the shadow in a single frame, pushed his team to create the best film possible. In the same way Bird was always thinking about the audience, Keller was developing a ratatouille recipe to please the senses. A diner eats with his eyes first, smells the comforting aroma of roasted peppers and sweet tomatoes. This meal was being served to an audience of millions around the world, who would hopefully leave the theatre hungry for French cuisine. A similar approach is taken by writers. Perfection is illusive most days. (All days?) We mostly strive for excellence, a strong sentence, a well-placed word at the end of a poem. We strive for feeling the a sense of purpose that fills our soul. You could say a good meal, a good film, a piece of art that makes you sigh, these are all versions of poetry. After all, what is poetry anyway? Poetry is an emotional response to the mighty world we live in. Poetry is composed, it is the right series of words strung together, the best you have to offer. So it art. So is life. We are always tumbling towards perfection, not with the goal of attaining it, but because the journey, the work, brings enough satisfaction to get you out of bed every morning. Inspired by Thomas Keller and various adapted internet recipes, including this one. I've seen Pixar's film a handful of times, and each time I've left craving ratatouille, obviously. This time, I decided to do something about it. An internet search turned up inconsistencies in the recipes claiming to be Thomas Keller's version of the film's ratatouille. The Pixar message boards include the proper name of the dish, Confit Byaidi, but include instructions using eggplant, yet failed to include eggplant in the ingredient list. Hmm. Deb made a lovely version, (her interpretation of the star dish) but peppers are layered among the vegetables instead of flavoring the sauce. Keller's version was inspired by a recipe in The French Laundry Cookbook, and includes two sauces. First, a tomato and pepper sauce that the vegetables are nestled in, and second, a vinaigrette to drizzle over the top. *Be aware that this dish takes about 2 1/2 hours to cook, plus prep time, so it's an ideal project to prepare throughout the day. Preheat the oven to 450 degrees F. Place the peppers cut-side down on a foil-lined baking sheet, and roast until tender and the skins begin to loosen, about 20 minutes. Remove and let rest until cool enough to touch, then roughly chop. Reduce the oven temperature to 275 degrees F.
Add 2 tablespoons of oil to a 10-inch cast iron skillet and warm over low heat. Add the garlic, onion, and season with a pinch of salt and pepper. Cook until soft but not browned, about 8 minutes. Add the tomatoes and their juices, two sprigs of thyme, the parsley, and bay leaf. Simmer until very little liquid remains, about 10-15 minutes. Add the chopped peppers and simmer for another couple of minutes. Season to taste with salt, discard herbs, and turn off the heat. Allow the sauce to cool slightly, then add to a blender. Puree until very smooth and season with additional salt and pepper. Reserve 1/4 cup of sauce for the vinaigrette, and pour the rest in the bottom of the cast-iron pan. While the sauce cooks, it's a good time to prepare your vegetables. Thinly slice the eggplant, zucchini and squash on a mandoline and place in a large bowl. Thinly slice the tomatoes with a sharp pairing knife. Don't worry if a few slices fall apart, they can still be used! Think of the next step as a meditation. You'll spend between five and ten minutes neatly arranging slices of vegetables around a pan, overlapping them ever so slightly. It might feel tedious, but see if you can find some joy in it. This is cooking. 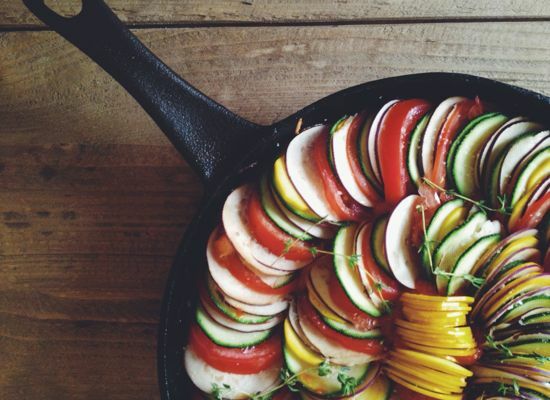 Starting from the outer edge of the pan, arrange alternating slices of tomatoes, zucchini, squash, and eggplant. Allow the slices to overlap so that about 1/4-inch of each slice is exposed. Repeat until the pan is filled. If you run out of zucchini, keep moving forward without it. If you complete two rounds and have extra yellow squash, fill the small opening with it. Don't worry if some of your tomato slices are too thin or too thick. It is a peasant dish, after all. The end result, will be beautiful, regardless. Scatter the remaining thyme slices over the top and drizzle with 1 to 2 tablespoons of oil. Season with 1/2 teaspoon of salt and a few grinds of pepper. Cover the pan with foil and bake until the vegetables are tender, about 2 hours. Uncover and bake for another 30 minutes. To make the vinaigrette, combine the reserved pepper sauce with 1 tablespoon oil and balsamic vinegar. Whisk together, then drizzle around the plate just before serving.